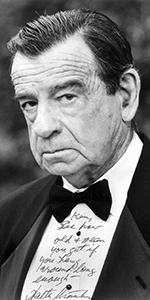 Walter Matthau, circa 1995. Photo by Ron Phillips. Walter Matthau became one of our most beloved Hollywood characters. After a long apprenticeship on Broadway and East Coast-based television, he eventually made the transition to features, where he became everyone's favorite sourpuss. Born and raised on the Lower East Side, young Walter tasted the theatre in summer camp shows. In high school, he earned pocket money working the concession stand at a local Yiddish theatre. When World War II rolled around, Matthau was a radioman-gunner in B-24's. He was in the same group as James Stewart. He flew during the Battle of the Bulge in December, 1944, and mustered out as a Staff Sergeant. Detremined to become an actor, Matthau studied at the Dramatic Workshop of the New School. He made a smashing Broadway debut by replacing several indisposed servants in Anne of the Thousand Days with Rex Harrison in 1949. Many television shows were shooting in New York during that time. Matthau first guest starred on The Big Story aired over NBC in August, 1950, and he guested in seven episodes of the Lux Video Theatre aired over CBS in 1950-1952. By this time, Matthau starred in George S. Kaufman's Fancy Meeting You Again. It flopped. He had a slot on Suspence aired over CBS in April, 1953, and guested on The Motorola Television Hour aired over ABC in May, 1954. He played Nathan Detroit in a revival of Guys and Dolls in 1955, which flopped. Matthau then took a role in Burt Lancaster's directorial debut, The Kentuckian (released in July, 1955), and was second billed to Kirk Douglas in his western, The Indian Fighter (released in December, 1955). He then starred on Broadway with Jayne Mansfield in Will Success Spoil Rock Hunter? for 444 performances, from October, 1955 to November, 1956. Matthau made a strong impression in A Face in the Crowd (released in June, 1957) with Andy Griffith, and got beat up by Elvis Presley in King Creole (released in July, 1958). He re-teamed with Andy Griffith in Onionhead (released in October, 1958). Matthau starred in and directed a low-budget crime film Gangster Story (released in December, 1959). There were always television shows to do: an episode of Route 66 aired over CBS in April, 1961, he did four episodes of Alfred Hitchcock Presents aired over CBS from 1958 to 1961, and starred on Broadway in A Shot in the Dark with Julie Harris for 389 perfs from October, 1961 to September, 1962. Matthau got the Tony Award for Lead Actor for this play. Films continued to fascinate. Matthau was in the western Lonely Are the Brave (released in May, 1962) with Kirk Douglas, and played a CIA operative in Charade (which played the Chinese in December, 1963) with Cary Grant. Really hot now, he took over from William Powell the role of "Doc" in Ensign Pulver (released in July, 1964) with Robert Walker Jr. in the title role. Returning to Broadway, he starred as sportwriter Oscar Madison in Neil Simon's The Odd Couple with Art Carney as Felix Unger for 964 perfs, from March, 1965 to July, 1967. Somehow, during all of this, director Billy Wilder wrote a scipt for Matthau, who would play a shyster laywer in The Fortune Cookie (which played the Chinese in November, 1966) with Jack Lemmon; Matthau would win a supporting actor Oscar for this film. The team of Matthau and Lemmon was used for the film version of The Odd Couple (released in May, 1968), which became a world-wide hit. His rubberly disdain was a perfect fit for the superproduction Hello, Dolly! (which played the Chinese in December, 1969) with Barbra Streisand. But the excesses of Dolly! were counter balanced with a string of small character comedies: A New Leaf (released in March, 1971) with Elaine May; Jack Lemmon directed him in Kotch (released in September, 1971) with Deborah Winters; and Martin Ritt's Pete 'n' Tillie (released in Dercember, 1972) with Carol Bernett. Matthau starred in a pair of great crime films: Charlie Varrick (released in September, 1973) with Joe Don Baker, and the incredible The Taking of Pelham One Two Three (released in September, 1974) with Robert Shaw. Reteaming with Billy Wilder, he starred in The Front Page (released in December, 1974) with Jack Lemmon, and then stepped in to take on a role Red Skelton turned down — Neil Simon's The Sunshine Boys (released in November, 1975) with George Burns. The Matthau vibe was on full display in The Bad News Bears (which played the Chinese in April, 1976) with Tatum O'Neal, and California Suite (released in December, 1978) with Alan Alda. Little Miss Marker (released in March, 1980) with Julie Andrews, didn't go anywhere, nither did Roman Polanski's Pirates (released in July, 1986). Matthau now segued into his "old man" phase, starring as Mr. Wilson in Dennis the Menace (which played the Chinese in June, 1993) with Joan Plowright as Mrs. Wilson, and enjoyed a large hit with Grumpy Old Men (released in December, 1993) with Jack Lemmon. He played a surprisingly convincing Albert Einstein in I.Q. (released in December, 1994) with Meg Ryan. His son Chris, directed him in The Grass Harp (released in October, 1996) with Piper Laurie. Grumpier Old Men (released in December, 1995) with Jack Lemmon, was another Christmastime hit, which was followed by Out to Sea (released in July, 1997) with Jack Lemmon, who helped at Matthau's Forecourt ceremony prior to the opening of The Odd Couple II (which played the Chinese in April, 1998). The film was only a monerate success. Matthau's final film was as co-starring with director Diane Keaton in Hanging Up (released in February, 2000) with Meg Ryan. In failing health due to a lifetime of heavy smoking, Matthau succumed to heart attack in July, 2000 at the age of 79. He is burried alongside Jack Lemmon and Billy Wilder in Westwood Village Memorial Park Cemetary. Mann's Chinese Theatre, Hollywood, California. 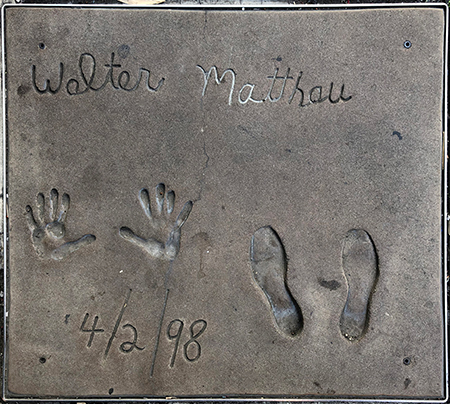 Walter Matthau Forecourt ceremony, Thursday, April 2, 1998. 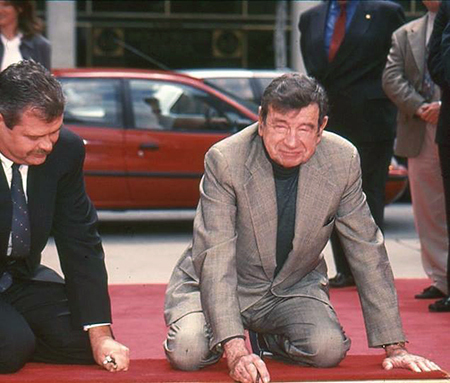 Walter Matthau flashes a typical face after signing his name in the cement.